One of my favorite things about visiting other countries is learning about that country’s history. Often when we go on vacation, we only scratch the surface of the destination. We only see what the tourism board wants us to see, the image they want to project. To westerners, Bangkok has an image of partying, the Red Light District and maybe its temples and palaces. But not so long ago, it was like many countries, mired in the throes of WWII. During WWII, Thailand found itself in the middle of two British-held territories, Malaya and Burma. Thus in December 1941, Thailand was forced to align with Japan to provide access between the two strongholds. Soon after, plans to construct the Thai-Burma Railway began. The Japanese needed a railway to transport supplies to their troops stationed in Burma. With the fall of Singapore, the Japanese found themselves with a large quantity of Allied prisoners of war. Although the railway was originally going to be built by forced and conscripted Asian laborers, the Japanese decided to put these POWs to work as well. The railway line was completed in 14 months and spanned 424 kilometers. However the construction of the Thai-Burma Railway came at a cost. The cruel conditions and abuse led to over 100,000 lives lost earned it the nickname of the Death Railway. The railway was mostly destroyed at the end of the war, but a small section of the route was later reopened. 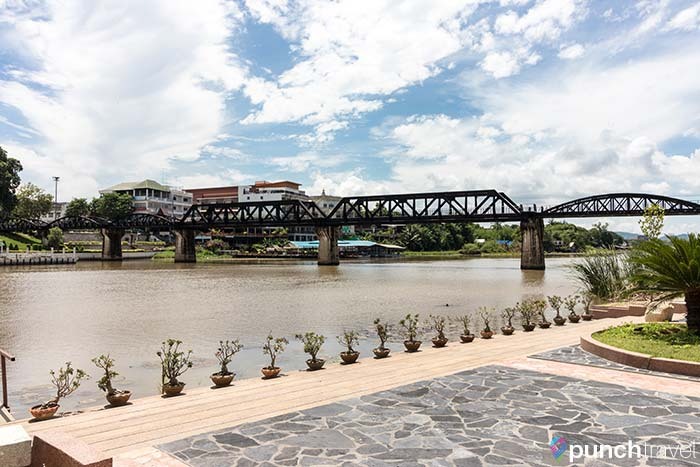 The town of Kanchanaburi where the famous bridge is located is a popular place to visit. 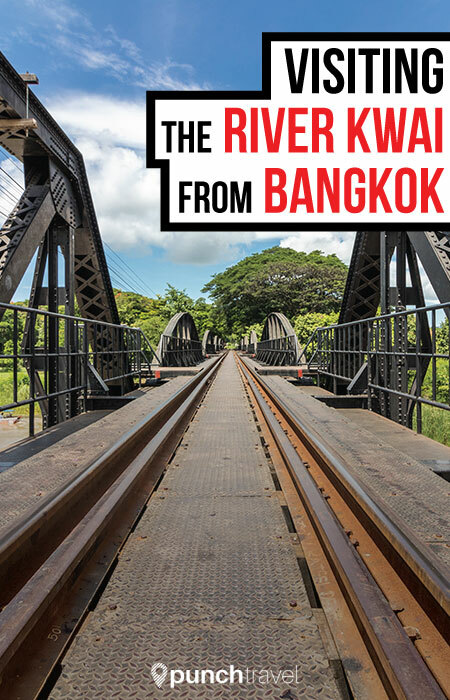 Kanchanaburi is an easy day trip from Bangkok, so we didn’t want to miss the opportunity to visit and learn about this important piece of history. 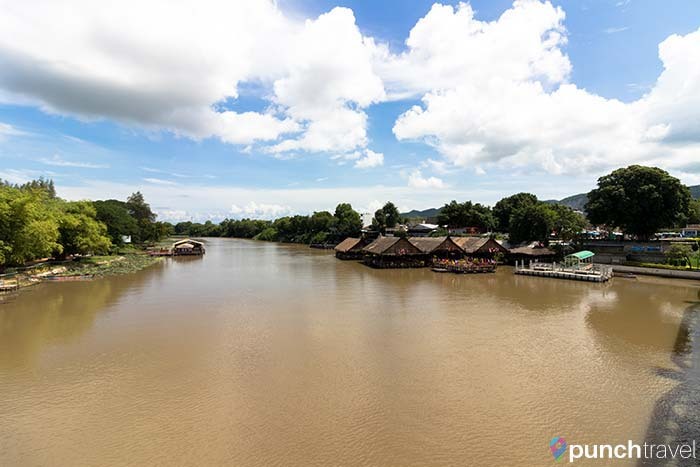 It is only fitting to visit the Kwai river by train. Two trains a day depart from Thonburi Station west of the Chao Praya River. Be careful – this is not the main Bangkok Railway Station! If you are taking a taxi or car service, make sure your driver doesn’t try and take you to the Thonburi BTS Station instead. Traveling by train in Thailand is a unique experience. 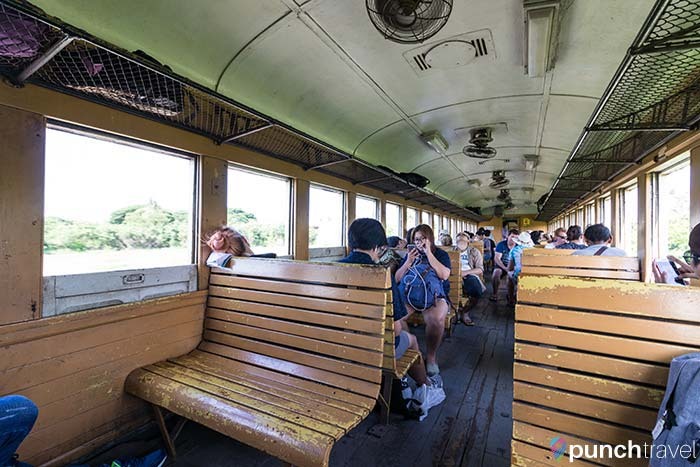 Although some other popular routes like the train to Chiang Mai or Phuket offer a first-class, air conditioned experience, the train to the Kwai river is third-class only. This means a slow ride on wooden seats with the windows open and a small ceiling fan for every two seats. The ride to Kanchanaburi takes about three hours and makes many stops along the way. Tickets cost 100 baht one-way and there is no need to book in advance. We showed up about five minutes in advance for the 7:45am train, the first train of the day. Tickets can be purchased at the station or on the train. 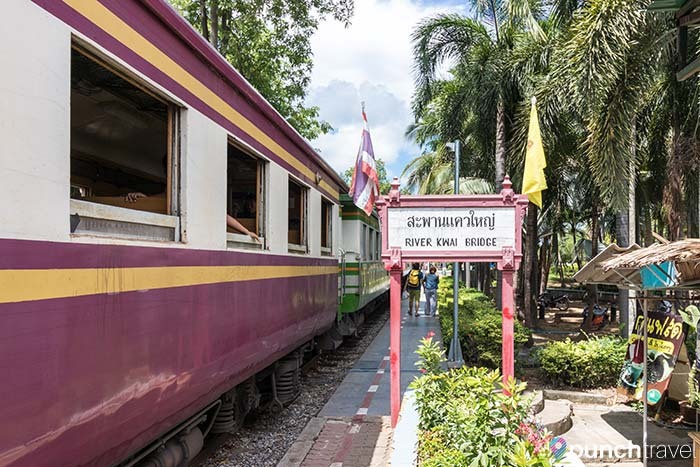 Arriving at Kanchanaburi you can either stop at the main town station or the next station, River Kwai Bridge station. The main station has volunteers to help visitors. 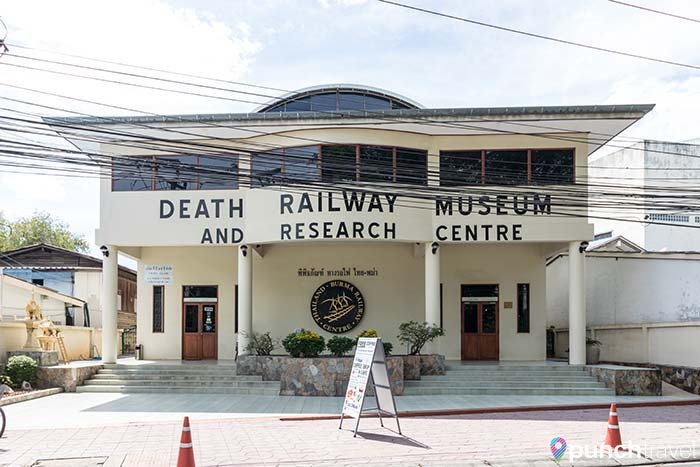 Stop at the Thailand-Burma Railway Centre first to get an overview on the history of the Death Railway. The museum introduces the historical climate of southeast Asia during WWII, and the background of planning and construction of the railway. Interactive displays detail the heinous living conditions and the scope of lives lost. Most poignantly, the museum contains various mementos, artifacts and photographs from the soldiers who worked on the railway, many donated by their children. As an added bonus, the museum is air-conditioned and each ticket (140 THB) includes a free coffee in their cafe overlooking the War Cemetery. This is the main POW cemetery for those who died during the construction of the Death Railway. 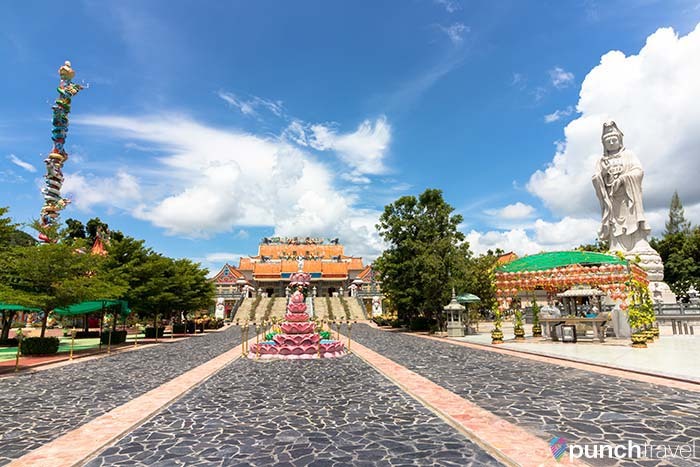 It is situated not far from the site of the former prisoner of war camp, Kanburi, which most of the prisoners passed through on their way to other camps. 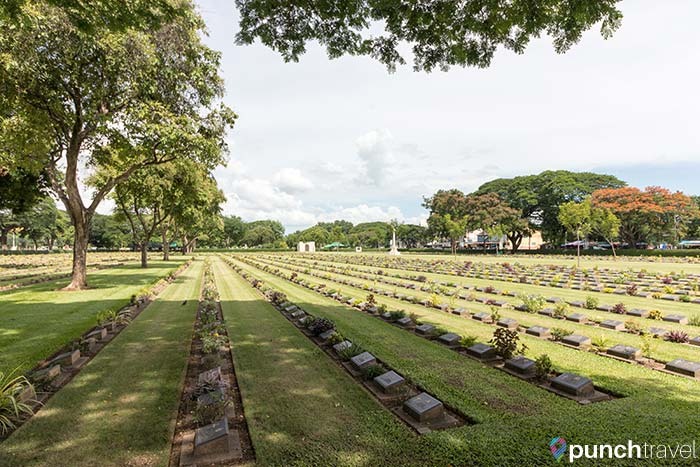 The cemetery contains a total of 6,982 graves, including 5,085 from the Commonwealth and 1,896 Dutch war graves. Remains from American soldiers were repatriated. The iconic bridge was bombed during WWII but was restored and today, visitors can walk across the bridge. On the other side of the river is a Buddhist temple and boat taxis that can ferry you up and down the river. Next to the riverside are a few restaurants catered to tourists. Unfortunately the area has fallen victim to the growing tourism trade, and several ‘museums’ have sprung up capitalizing on the tourist boom. There are two museums bearing the name JEATH Museum and we unfortunately went to the wrong one then to the right one. Located right next to the bridge is the wrong one, called the JEATH Museum and Art Gallery. It is a somewhat mind-boggling compendium of assorted artifacts and displays. The museum is a hoarders paradise of not only WWII memorabilia, but also displays on Thai history, culture, stamps, musical instruments and coins. It does offer a nice view of the bridge and tickets are 40 THB. The real JEATH Museum is actually much further away, south of Kanchanaburi Station on Pakprak Road. It consists of three areas, including a recreation of a bamboo hut where the POWs lived. Admission is 50 THB. We spent about half a day in the area, and that was plenty of time to visit the bridge and museums in the area. If you want to explore further, you can take the train to Nam Tok waterfall. 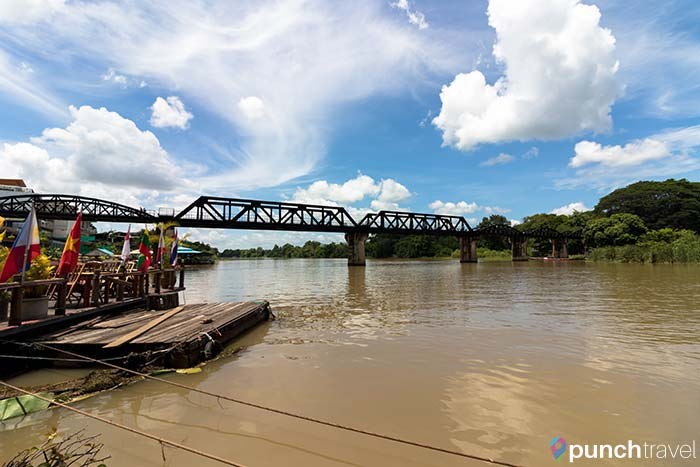 Along the way, the train will cross the actual River Kwai bridge, as well as the scenic cliffs on the way to the waterfall. Another important area is what’s known as Hellfire Pass (Konyu Cutting, the deepest and longest railway cutting on the Thai-Burma Railway. One can only imagine the tortuous toil the POWs and workers undertook to accomplish this impossible task. If you have seen the movie The Railway Man, this is where Colin Firth’s character meets with his Japanese torturer at the end of the film.